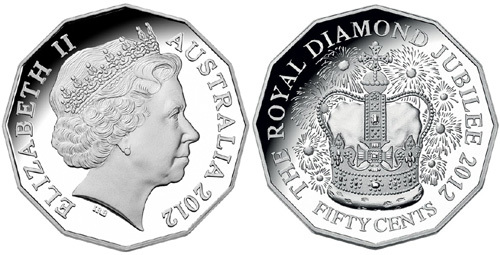 The Royal Australian Mint have announced the issue of the latest coin to mark the Diamond Jubilee of Queen Elizabeth II, which will occur on the 6th February of this year. Queen Elizabeth II has been head of State of the Commonwealth of Australia since 1952 and has paid no less than 16 official visits to the land down under during these last 60 years, more than any of her predecessors. (A commemorative coin was issued on the occasion of her last visit in 2011 for the Commonwealth heads of government conference.) To mark this extraordinary milestone, the Mint will issue both a circulation and collector’s coin of 50 cents with a reverse design specially commissioned by royal jeweler Stuart Devlin. The reverse depicts the Crown of St. Edward in the foreground, which is considered a senior object of the British crown jewels. It has been carried in procession during the coronation of all English and British Monarchs since 1661. (The original crown of the same name was said to have been destroyed by order of Oliver Cromwell during the English civil war.) The crown was once again used during the actual crowning ceremony for King George V in 1911. Displays of fireworks are depicted in the background along with the commemorative text “THE ROYAL DIAMOND JUBILEE 2012”. The design is a befitting tribute to the 60 year reign of the Queen. The obverse depicts the Queen in profile, the portrait is sculpted by Ian Rank-Broadley and has been in use since 1998. The coin is minted in two versions, a circulation strike in cupro-nickel and a collector’s edition struck to a proof quality in .999 silver with a weight of 18.2 grams and a diameter of 31.5 mm. A limited mintage of 10,000 pieces has been authorized for the silver version.